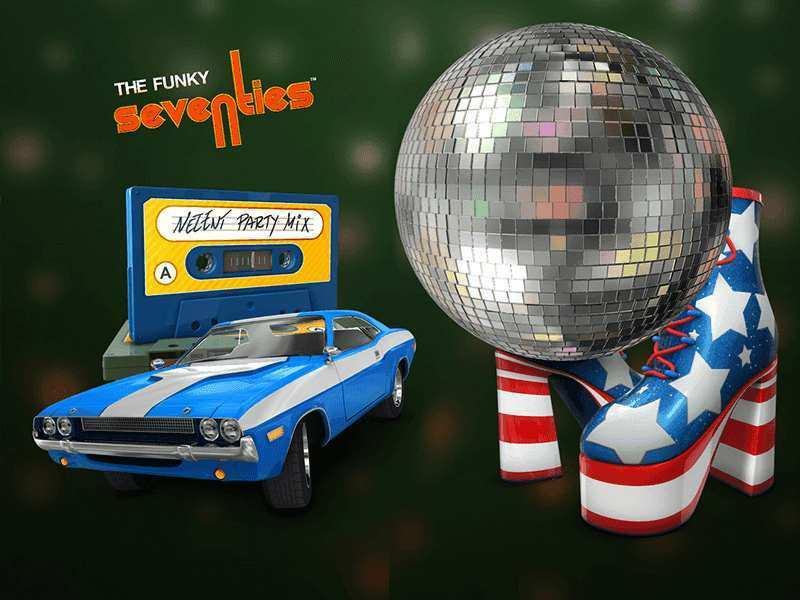 People in the age group of 45 and above would definitely have some recollections about the Retro Funky 70S. Those of us who were born in that decade or earlier would remember the popular Beatles music composed by the four boys from the UK, disco dancing, bizarre fashion, vintage cars, radios, TV, and telephones. One of the best names in the gaming software industry is NetEnt which has created many popular online casino games. They have cashed in on this retro theme. The result is a treat for all those who love gambling online either for free or for real money. You will surely love to play free Retro Funky 70S casino slot machine. The benefit provided by this slot machine is a good number of betting options which you can select from the 40 pay lines. There are also five wagering levels available. At the bottom of the screen, there are 5 buttons which you can operate using your mouse. Below these 5 buttons, a black bar can be seen. This displays your selection of Bet Level, Bet Lines, Coins and Coin Value. There are five Bet Levels. You can decide the number of coins you want to play with per pay line. Bet Lines will adjust the number of active pay lines. Some numbers on the sides of the reels have to be clicked. Spin is a button in the middle with 2 arrows. It will make the reels start spinning. With just one click of Max Bet, you can play the greatest number of pay lines at the highest level. But you need to fix the coin size before you click this button. Coin Value lets you decide the coin size you want to play with. Each click will increase the coin size. There are various coin sizes like 0.01, 0.02, 0.05, 0.10, 0.20, and 0.50. Paytable lies just below the reel on the extreme left. The details of active pay lines, the prize-winning symbols, and the payouts can be known from the Pay Table. For each active bet line, the payout is made only of the highest win. Several wins on numerous bet lines are clubbed together. Retro Funky 70S Online has been developed by NetEnt in such a way cannot help feeling he has gone back in time to the groovy 70S. The symbols have thus been carefully chosen to reflect that era. Playing Card Values namely J, Q, K, and Ace. These offer a very low payout. A Sparkling Disco Glitter Ball. Payouts will be 20, 75 or 250 for three, four or five silver balls respectively. See-O-Matic Camera or goggles. This offers the same payout as the Disco Glitter Ball. Cassette Tapes. For 3, 4 or 5 of these, payouts would be 5, 50 or 150 respectively. Platform Boots. The payout, in this case, would be the same as that for the cassette tapes. A large blue car from the 70S with white stripes. For 3, 4 or 5 of these, payouts will be 25, 100 or 400 respectively. A computer of that generation or a Cash Register Machine. The payout, in this case, is the same as that for the car. The 70S icon which is the game`s logo is the Wild. To get a winning combination this Wild has to take the place of all other symbols except for the Scatter. If you get a number of Wilds on a reel, they will get stacked on top of one another. Payouts from 3, 4 and 5 Wilds would be 50, 200 and 1000 respectively. The Scatter symbol is an African girl. This icon can be seen all across the five reels of the game. Three or more scatters will fetch you 5 free spins. Not only that, three or more African girl icons will double your winnings. A win during those free spins will again be multiplied by 2. If again 3 or more Scatter symbols appear during Free Spins, you will be awarded 5 additional free spins. Now, how do you like that? If you do not wish to play for real money, you do not have to make a deposit. You can also play Retro Funky 70S Online with no download required. Excellent graphics, easy gameplay, great music and plenty of winning opportunities make this one of the best slot machine games developed by NetEnt. 0 responses to "Retro Funky 70S Slot"